Preheat oven to 350 F degrees. Grease a Bundt pan or two loaf pans and dust with flour. Combine 3 cups of flour, baking powder, baking soda, 1/2 tablespoon cinnamon, and kosher salt in medium bowl and whisk until incorporated, set aside. In separate bowl blend 1/3 cup sugar with remaining 1/2 tablespoon cinnamon and 2 tablespoons flour and carefully toss gently with sliced pears until dry ingredients cover the pears. In large bowl with electric mixer beat butter at medium speed until creamy. Gradually mix in remaining sugar, and continue beating until light and fluffy. Add eggs, one at a time. Slowly add flour mixture, on low speed, until blended. Add apple juice and extracts. Blend until smooth. Spoon: 1/3 batter into prepared pan and smooth over bottom. Top with half of the tossed pears. Spread another layer of batter, then pears. 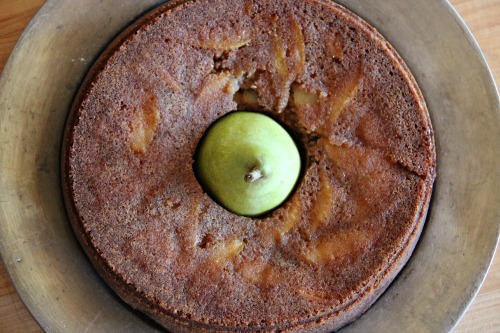 Top with remaining batter to cover pears. Bake 1 hour and 15 minutes, or until cake is golden brown and wooden stick inserted comes out clean. Transfer to a wire rack to cool. Invert onto plate and dust with powdered sugar. *Apple juice can be substituted with Orange juice; also substitute lemon extract with almond extract- which pairs with Orange.